Bob Condotta spent a dizzying couple of days at the NFL combine. After hearing from Pete Carroll and John Schneider, here are the takeaways he's bringing home to Seattle. INDIANAPOLIS — It’s been a dizzying first few days at the NFL combine of news conferences with coaches and general managers and lots of just trying to hear what people are saying. While Pete Carroll and John Schneider never said publicly what Thomas was asking for, that was always the rumor — that he wanted to at least be the highest-paid safety in the league, if not among the highest-paid of all defensive players. Thomas was at the top of the safety pay scale when he signed with the Seahawks in 2014, a deal paying him $10 million a season. To be the highest-paid safety now would mean a contract of at least $13 million a year or so, over four or five years or so. If there was ever a time the Seahawks might have been considering that — and I’m not sure there was — it certainly wasn’t going to happen now after his holdout and another broken leg. What Thomas really ends up getting will be one of the most intriguing things to watch when free agency officially begins March 13. Both Carroll and Schneider made it clear that Frank Clark will remain with the Seahawks, indicating he will not become a free agent March 13, having either been slapped with a franchise tag by March 5 — which would mean being given a one-year guaranteed contract of about $17.3 million or so — or signed to a long-term contract. Of course, the Seahawks can give Clark a tag by March 5 to assure he can’t become a free agent even if no deal is reached by then, and then continue to negotiate through July 15. 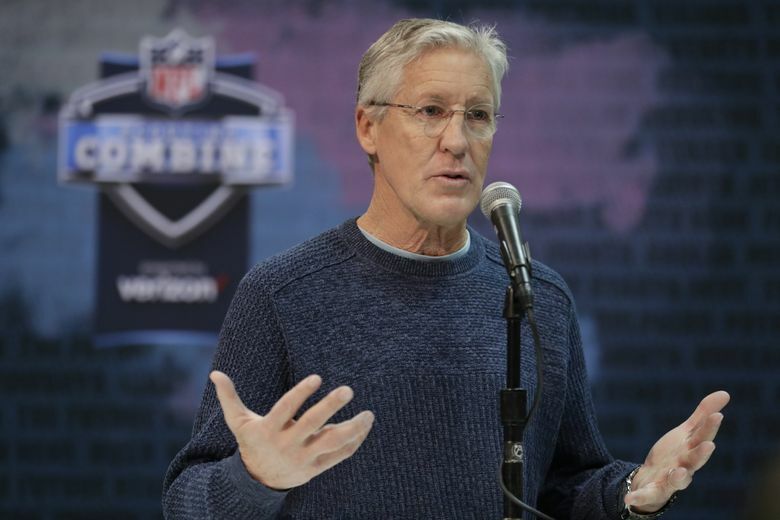 Indications are that the Seahawks are hoping that Clark will not actually play the 2019 season on a franchise tag and that the team will get a long-term deal done. For one, it helps with the 2019 salary cap. The team would have to take all of the tag number on the cap in 2019 but a long-term deal would mean a lower number this year. For another, the team knows Clark would rather have his long-term future set and avoid the kind of complications and uncertainty that can come when players have played on a tag. It figures to be an interesting few days until Tuesday to see if the Seahawks can get something done with Clark. Both Carroll and Schneider revealed that receiver Doug Baldwin had surgeries on his knee and shoulder since the end of the season, with Carroll saying he anticipates Baldwin being ready for the start of training camp, if not earlier. He said tight end Will Dissly (rehabbing a patellar tendon injury) was the only player who was a real question. But the bigger picture here is that with Baldwin turning 31 and coming off a season in which he dealt with myriad injuries and turned in his fewest catches since 2013, the Seahawks are going to have to plan for the post-Doug Baldwin future sooner rather than later. Not that receiver didn’t already seem like a need for the Seahawks to at least add a more consistent third receiver in 2019. But how physically able Baldwin will be in 2019 and how much he will be able to contribute might be more of an uncertainty than the way Baldwin ended last season — such as his marvelous outing against Kansas City in Week 16 — let on. One source said there’s more of a concern in the organization about how Baldwin will recover this offseason — the knee is thought to be the biggest issue — than Carroll’s comments might indicate. The Seahawks made it clear in December that the team was not for sale, something the team reiterated here. The Seahawks are now officially held by the Paul G. Allen Trust with his sister, Jody, as the trustee. But by all accounts, this is not just a “for now’’ thing while Jody Allen figures out the rest of Paul Allen’s vast estate. Instead, a few here said that it has been something of a surprise how enthusiastically Jody Allen has taken to heading up the team and how engaged she has been in the team’s activities. That doesn’t mean day-to-day meddling in team affairs. But when Paul Allen died, Seahawks coaches and other personnel, as well as those around the league, really had no idea what was going to happen next. As Carroll said here, he had never really talked to Jody Allen before Paul Allen’s death in October. “Next to none, really,’’ Carroll said of what his interaction was with Jody Allen before last fall. He’s had a lot since then, and his comfort with Jody Allen became clear in December when he signed an extension keeping him with the team through 2021. Since the team has yet to make a major personnel move under her watch other than re-signing Carroll in December — which admittedly was a big one — there’s still some curiosity in seeing how things develop. But one person said that if anything, early indications are that Jody Allen might even be more willing to be as aggressive as possible to keep the team at a high competitive level each season than was Paul Allen, whose general inclination when it came to the Seahawks was said to be to think more about the long-term big picture. Who knows? Maybe the Seahawks are able to re-sign one or both of veteran guards J.R. Sweezy and D.J. Fluker before free agency on March 13. If they don’t, though, don’t take it as the team not wanting them back. Both Carroll and Schneider said the team wants to retain each player and keep intact an offensive line that guided the Seahawks to the number one rushing attack in the NFL last season. But both players also appear to want to see what the market will bear, and the Seahawks might be willing to let the market set the price with Carroll seeming to hint each player may find quickly their best option is Seattle — a course that at least means they wouldn’t have the second thoughts that can sometimes come with not at least seeing what else is out there. Both Carroll and Schneider laughed off the rumor passed along last week by FS1 host Colin Cowherd that Russell Wilson’s wife, Ciara, might prefer that the couple be based in New York to help her entertainment career and that Wilson might prefer to be traded to the Giants, who need a quarterback with Eli Manning nearing the end of his career. What also hasn’t escaped notice is that both Ciara and Cowherd are represented by the same agency — CAA. In fact, Wilson and Ciara signed in January with CAA to “rep the couple in film and television endeavors, among other categories,’’ as stated in a deadline.com report. Cowherd acknowledged the rumor he heard was on the “entertainment side.’’ So yes, the consensus here is that Cowherd likely heard something but that when it comes to Wilson’s Seahawks future, whatever he heard doesn’t mean anything. As for where things stand with Wilson, the status quo remains. Wilson’s agent, Mark Rodgers, attended the combine, and it’s thought he met with the Seahawks to at least talk preliminarily about an extension of Wilson’s deal, which runs through the 2019 season. But Clark and other impending immediate free agents remain the most urgent matter and any real serious heavy lifting on Wilson’s contract won’t likely come until the spring and/or summer. The stabilizing of the ownership situation should only be an advantage for Seattle, though Wilson’s camp will surely be watching how the team handles the upcoming free-agent season and draft. By the way, it is still expected that Wilson will take part in at least a day or so of spring training for the Yankees this month. Last year, Wilson spent six days with the Yankees. Wilson has been in Brazil in recent days but it’s thought he’s making plans for an appearance at Yankees camp — likely shorter than last year — in the coming weeks. Fant is a restricted free agent, and the Seahawks will have to decide soon whether to tender him and at what level — he’d at least get a one-year deal at a little over $2 million. The thought has been Fant will be given a chance to compete at tackle. But if the Seahawks are able to re-sign Fluker and Sweezy, then the starting five from last season could stay the same (center Justin Britt, left tackle Duane Brown and right tackle Germain Ifedi are all under contract through at least 2019). And that means Fant could stay in the hybrid eligible tackle/tight-end role he had last season that the team viewed as a key to its running success. In an answer to a question about Dissly in which Carroll said the team is hoping he will be available for the 2019 season, he also waxed pretty enthusiastic about Fant’s tight-end role.